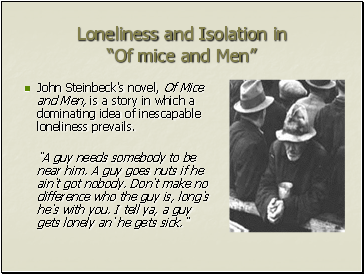 John Steinbeck's novel, Of Mice and Men, is a story in which a dominating idea of inescapable loneliness prevails. "A guy needs somebody to be near him. A guy goes nuts if he ain't got nobody. Don't make no difference who the guy is, long's he's with you. I tell ya, a guy gets lonely an' he gets sick." Of Mice and Men is filled with characters such as this, who are unable to find a way out of their lonely lives. The loneliness in this story builds and builds and never is allowed to escape. 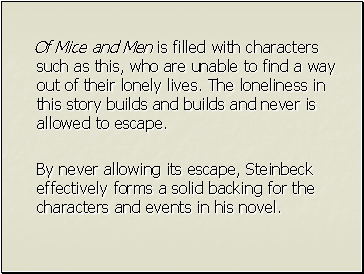 By never allowing its escape, Steinbeck effectively forms a solid backing for the characters and events in his novel. 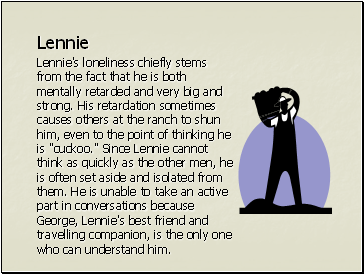 Lennie's loneliness chiefly stems from the fact that he is both mentally retarded and very big and strong. His retardation sometimes causes others at the ranch to shun him, even to the point of thinking he is "cuckoo." Since Lennie cannot think as quickly as the other men, he is often set aside and isolated from them. He is unable to take an active part in conversations because George, Lennie's best friend and travelling companion, is the only one who can understand him. 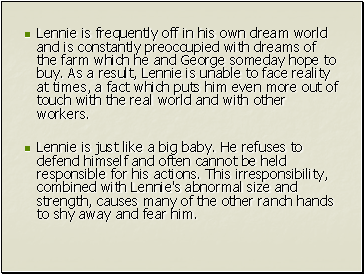 Lennie is frequently off in his own dream world and is constantly preoccupied with dreams of the farm which he and George someday hope to buy. As a result, Lennie is unable to face reality at times, a fact which puts him even more out of touch with the real world and with other workers. Lennie is just like a big baby. He refuses to defend himself and often cannot be held responsible for his actions. This irresponsibility, combined with Lennie's abnormal size and strength, causes many of the other ranch hands to shy away and fear him. The men are afraid of Lennie because they know that if his great strength were ever to go uncontrolled, it could easily overwhelm any one of them. 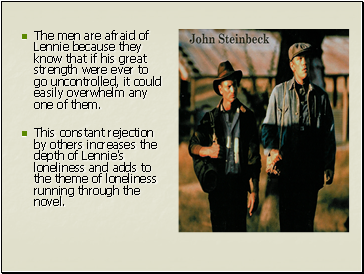 This constant rejection by others increases the depth of Lennie's loneliness and adds to the theme of loneliness running through the novel. 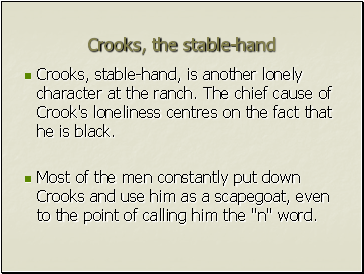 Crooks, stable-hand, is another lonely character at the ranch. 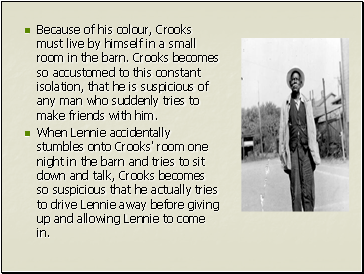 The chief cause of Crook's loneliness centres on the fact that he is black. Most of the men constantly put down Crooks and use him as a scapegoat, even to the point of calling him the "n" word.